A. When I was a teen, I NEVER wanted to read. (I did for school, but that is about it.) There was so much other stuff to do. NOW, I would rather stay home and read than do ANYTHING else. haha I think if the YA genre was this awesome when I was a teen, I might have read more. I like to think so, anyways. 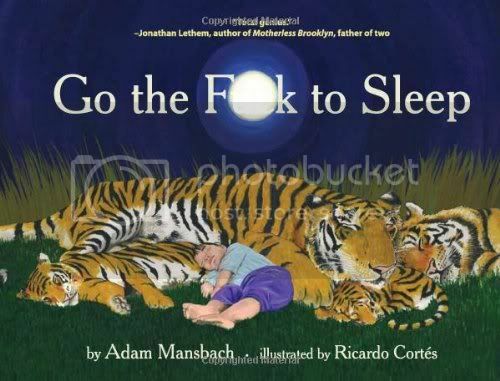 Go The F**K to Sleep by Adam Mansbach. I don't have this book in my collection, not sure if I would want it or not, but that's a crazy title! YA today is amazing! At least you can read good YA books now! Hahha I read that picture book! made me laugh so hard!!! I totally agree about your interesting title. lol Despite that fact, we do have it in our library system, and I find that priceless. Have a wonderful weekend! Hopping through. I read as a teen but not like I do now. I mostly stayed home when I was young but wasted my time. Now I stay home and read. I am really enjoying the YA genre at the moment, there are some great releases. I was actually just talking about this! It's like naptime. You couldn't pay me to take a nap as a child, but now I would pay you to allow me to take a nap. I think it's the same with reading. As a child we often don't cherish as much as you should. Lol. That is definitely a crazy title. I'm the complete opposite. I have had my nose buried in a book my entire life. *sighs* YA in the last few years - amazing! Before the age of 12, books weren't a blip on my radar! But then high school began and somehow one good book turned into this! Here's my Follow Friday. Have a nice weekend! I was the same. I hated reading as teen, mainly because of the books we got forced to read in high school. There's so much more variety now. Ha ha!! I've seen that one in the blogosphere! Totally love the title! Whoops! Think I didn't post my comment right! I was always an avid reader, even as a teen. But back then finding paranormals was extremely hard! Love the title of your book choice! Seen it in the blogosphere and love it for its title! Old follower, just showing some love! I've always liked reading, but I never used to read as much, or as many genres. I used to real almost solely paranormal, but I read loads more genres now! And lol a that title, I've never heard of that book before! The YA genre was not this awesome when I was a teenager, I wish it had been. I did read a lot though. Go The F%#k to Sleep was actually given to someone at a baby shower I went to. It seems to be a popular gift for parents to be. The title is hilarious though especially when you consider it looks like a children's book. Brett and others how do you post the link without showing the entire link address? Great answer!!!!!!! That's too funny!! Haha! I listened to the audio version of Mansbach's book and laughed so much! Feel free to check out my BBH here. New follower as well! By the way I adore the layout of your blog! =) Yeah for YA! I'm suprised you didn't read much as a teenagers. I'm the same way. I never wanted to read either. I didn't read for school either. I avoided reading at all costs. I'm glad I'm jumped on the reading bandwagon, finally. YA is awesome :D I would have totally spent more time reading if I had found YA in my teens. I am just popping in from Parajunkies Follow Friday blog hop! I did listen to 'Go the F__K to sleep' it was narrated by Samuel L. Jackson. At first I thought it would be hilarious, then I just thought it was a little too much in the 'F' department. Hey Happy Reading And follow me!! Your answer to the first question would be my exact answer as well! You couldn't get me to read much in high school or college outside of the required reading, but now I just want to sit home on my days off and bury my nose in a book:) I'm a happy book nerd! Hope you have a great weekend Christy! Stopping by via Parajunkee's Follow Friday. I'm following you.